Tania Monreal is a vet with a difference. No pampered poodles or fluffy kittens on her examination table. In fact, you are far more likely to find her wearing a wet suit than traditional vet scrubs and her patients are quite likely to be submerged in water and sporting a flipper or fin, rather than fur. Tania’s patients are some of our most treasured yet endangered ocean dwellers, from sea turtles to whales, dolphins and even the odd stingray. Working with a small but dedicated team at the CRAM Centre (Foundation for the Rehabilitation and Conservation of Marine Animals) in Barcelona, Tania has been training staff to deal with some of the sick and injured animals that wash up,or are rescued, in and around the Catalan coast. WVI is proud to be sponsoring Tania and her work in the Mediterranean. Just a few decades ago, turtles, whales and dolphins were a common site off the Catalan coast, and around Barcelona’s port. Like the rest of the Mediterranean, however, these days, most large marine animals are under threat with numbers dwindling at an alarming rate thanks to fishing practices,over-development, and pollution. Each year, more than 20,000 marine turtles are accidentally hooked by the long lines of commercial fishing boats or caught in nets. If the hooks remain lodged in the animal, as is often the case, it can cause a horrible, slow and painful death. Turtles caught in nets that appear alive and active, are often released by well-meaning fishermen, but may subsequently die from decompression sickness, (the bends), having been brought to the surface too quickly in the nets. CRAM have developed strong connections with the local community, to such an extent that they are the first port of call when an injured marine animal, like a turtle,is spotted, washed to shore or brought in by a fisherman. Loggerhead turtle 'rescued' from a driftnet. Sadly prognosis isn't good. 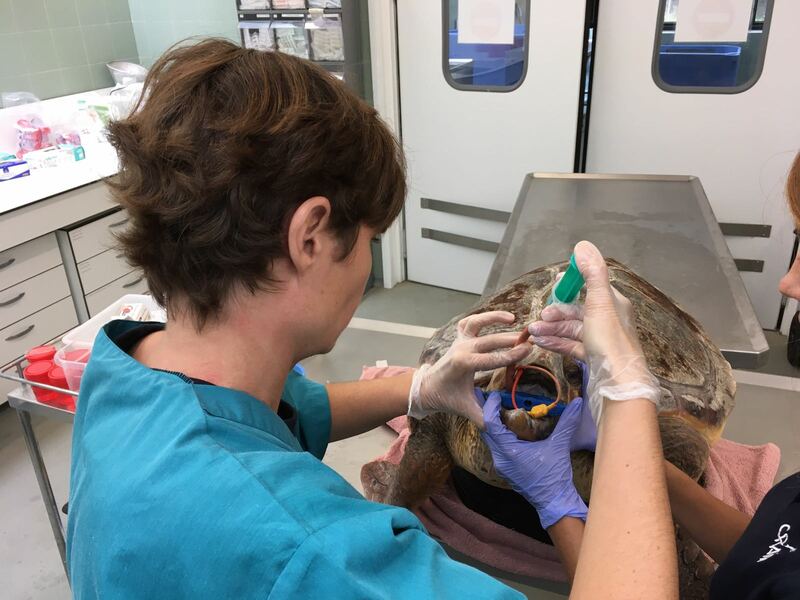 Tania has recently helped with the very sad case of a Loggerhead turtle that got caught in driftnets for some time. 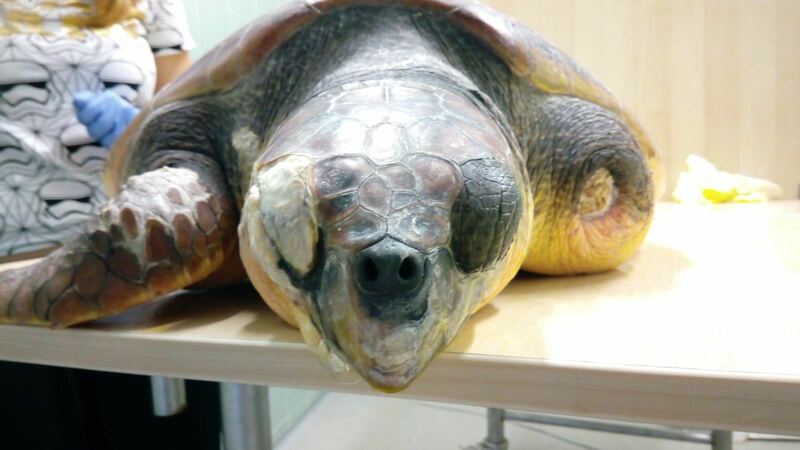 The net had amputated the turtles flipper, leaving the bone exposed, and had lacerated its neck causing large lesions over one eye, shoulder and front fin. Tania’s work in training the staff at CRAM,and her advice on specific cases like this mean that this poor turtle is getting the best treatment possible, although sadly the prognosis is not good and we are still waiting to hear whether the treatment and recovery have been successful. A happier out come for a common stingray that swam unusually close to people paddling in the sea just north of Barcelona, with a shark bite, that had removed part of its’ right wing. The team from CRAM were alerted,government officials took a video of the animal, and Tania was able to offer advice over the phone. The ray was given a shot of long-acting antibiotics and released back into deep water, job done with no need for rehab. 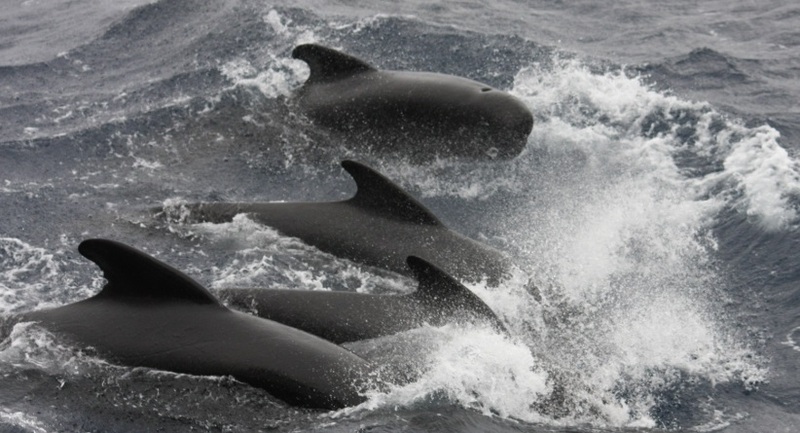 Tania also recently advised when a pod of pilot whales became stranded too close to shore. Tania was able to advise the team to identify the leader of the pod, get him out to deep water and the rest of the pod will follow. Tania is part of a network of experts who are called upon for stranded cetaceans (whales and dolphins) and hers and others expertise meant that this pod were lucky and led safely back out to sea. WVI is excited to be able to support Tania’s amazing work and the team at CRAM in helping these wonderful marine creatures. Tania's day job is a veterinary consultant for International Zoo Veterinary Group. And donate here to help.